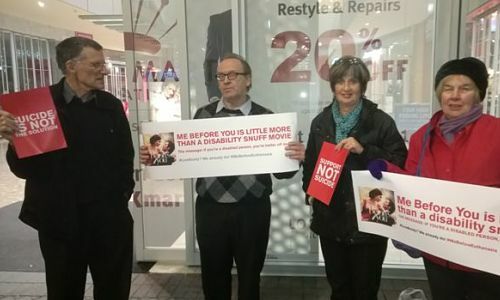 Euthanasia-Free NZ supported peaceful protests led by disabled people against the movie “Me Before You”, which was released in New Zealand today. People of diverse ethnic and socio-economic backgrounds joined demonstrations in Auckland, Hamilton, Tauranga, Christchurch and Wellington. [Spoiler alert] In the movie the lead male character, Will, ends his own life, simply because he doesn’t want to use a wheelchair. He has everything else going for him and has access to opportunities and support that most people with disabilities would only dream of having. According to the movie it’s hashtag #LiveBoldly only applies to non-disabled people – not to the 24 per cent of New Zealanders who were identified as having one or more disability in the 2013 census. 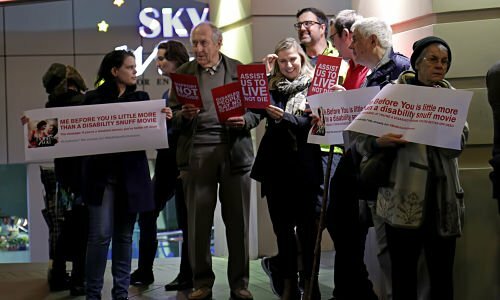 “We are concerned about the dangerous messages that are portrayed by the film”, said Renee Joubert, Executive Officer of Euthanasia-Free NZ. “The movie implies that it’s better to be dead than to use a wheelchair and that disabled people do able-bodied people a favour by killing themselves. The response from the public was overwhelmingly positive. Several people whipped out their phones to take photos of the signs. Many stopped to chat. A woman picked up spare signs and joined the protest. She asked to display them in her window at home. A man read one of the large signs, frowned, read it again and then nodded as he walked away. A passerby with an invisible disability stopped to shake the demonstrators’ hands and told his story of suffering abuse. An elderly woman with a mental disability lamented her difficulty in accessing support services. A concerned young man urged some protestors to talk to a nearby homeless man who had earlier complained of kidney pain so intense that he wanted to die. When the group arrived where the man was sitting, he had changed his mind. A friend was keeping him company, he received some food to eat and had been examined by a doctor. Several protesters commented afterwards on how rewarding they found the experience. In at least two centres, they are planning follow-up events at subsequent screenings.